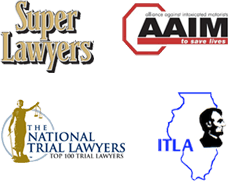 As experienced Chicago personal injury lawyers we handle many cases that involve distracted driving accidents. In today's busy society, multi-tasking has become a daily activity for many. Multi-tasking while driving has become an epidemic. The use of mobile devices or cell phones while driving has become a serious hazard on our roads over the past decade. Even the most experienced driver can become distracted by talking on the phone, causing a serious or fatal car crash. Thousands of accidents happen every day in Illinois due to distracted drivers. A distraction is a diversion of one's attention. It is anything that takes the drivers attention from the road. An experienced Chicago distracted driving accident lawyer recognizes, the number one distraction resulting in a accident is talking on the cell phone. Texting while driving is close behind. It is crucial that drivers remember that the most important task behind the wheel is driving safely. In the State of Illinois, localities are permitted to determine their own laws regarding cell phone utilization while driving. The City of Chicago has made using a cellular device without a hands-free device illegal except for school bus drivers and teen age drivers, who cannot use a cellular device while driving at all. As Chicago injury lawyers, we recognize that the State of Illinois, has chosen to enact what is called a hands free legislation. A hands free device was designed to free up the hands of drivers so take they could maintain control of the steering wheel. There is much controversy as to whether or not the hands free device makes driving safer. The driver using a hands free devise is distracted, by talking and not giving driving the full attention that it deserves. In The State of Illinois, it illegal for teen drivers and school bus drivers to use mobile devices. They are allowed to use a mobile device in an emergency situation. Texting while driving has been banned in The State of Illinois. It has also banned talking on a mobile device in a school or construction zone. How can cell phone use be proven in a lawsuit? A skilled Chicago distracted driving accident attorney can subpoena the negligent driver's cell phone records. These records can be used to determine if the at fault or negligent driver was talking or texting at the time of the accident. What additional information can be obtained from cell phone records? Was the driver texting while the car was in motion. If you are involved in an accident that was caused by a distracted driver talking or texting, it is critical that you contact an experienced Chicago distracted driving attorney to preserve the evidence of your case. Mobile phone or cell phone records are only accessible for a limited period of time. An experienced cell phone distraction attorney understands that a rapid recovery of the cell phone records needs to occur. With the use of the cell phone records, our experienced cell phone distraction lawyer will establish a pattern of the cell phone use while driving to further strengthen your case. A personal injury lawsuit should be filed immediately after the accident's occurrence in order to preserve the evidence.